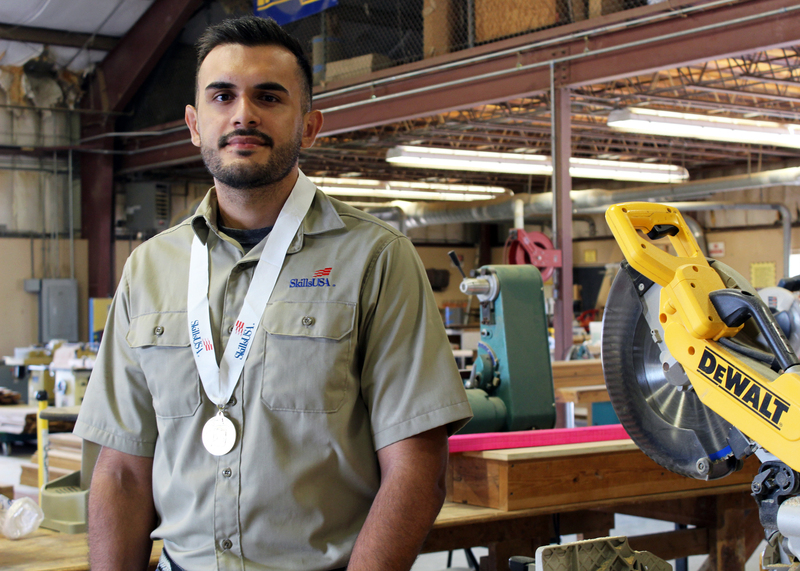 (HARLINGEN) – Rodrigo Patron built a fire pit brick by brick, 200 to be exact, in only six hours, to earn a spot at the 54th annual SkillsUSA National Leadership and Skills Conference in Louisville, Kentucky. The Mexico native is the only student from Business Construction Technology at Texas State Technical College in Harlingen to earn a gold medal in Masonry at the SkillsUSA competition held at TSTC in Waco earlier this spring. At the end of the month, Patron will have the opportunity to compete against thousands of other students from across the United States at the SkillsUSA national competition. SkillsUSA is a professional organization teaching technical, academic and employability skills that help high school and college students pursue successful careers. Members build these skills through student-led team meetings, contests, leadership conferences and other activities. Students in Skills USA participate in hands-on competitions in various fields such as science, technology, engineering, mathematics, building construction and culinary arts. Patron, who has lived on his own since high school, said he came to America to chase opportunity and dreams. He played baseball for an Arizona high school, before arriving in South Texas to be closer to his brother, who is a local attorney. “Had it not been for me leaving my home in Mexico, I would have never had an opportunity like SkillsUSA or TSTC,” said Patron. Patron said nationals is something he has been preparing for since his first day of practice for local and state SkillsUSA competitions. He has spent every Friday afternoon in the lab since the beginning of the year honing in on his masonry skills. TSTC Building Construction Lab Assistant and SkillsUSA Advisor Alfonso Gonzalez said Patron is one of the program’s best students. Gonzalez has some advice for students like Rodrigo who are competing at nationals. “SkillsUSA is a wonderful experience for our students and I want them to know we are already proud of them…the big step is taking the initiative to compete in the first place,” said Gonzalez. Patron said SkillsUSA has already been a fun and memorable experience for him and he hopes to represent well in Kentucky. Building Construction Technology is offered at both TSTC’s Harlingen and Waco campuses. For more information on the program, visit tstc.edu.